"I Want To Understand Women!" Can men really understand women and what women want? A man was walking along the beach when he stumbled upon a Genie's lamp. He picked it up and rubbed it, and lo-and-behold a Genie appeared! 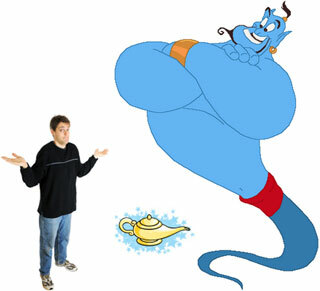 The Genie said, "Nope... due to inflation, constant downsizing, low wages in third-world countries, and fierce global competition, I can only grant you one wish. So... what will it be?" The man didn't hesitate. He said, "I always wanted to go to Hawaii. But I can't go by plane because I suffer from airplane phobia and can't go by boat because I get seasick. My wish is that you build a bridge from San Francisco to Hawaii, so I can drive there! The Genie pondered for a moment and exclaimed, "Oh boy! This is the most outrageous wish I've ever heard! Have you got any idea how difficult and costly this is? Forget it! Can't be done, make another wish." The man thought for a minute and said, "Well, I've always wanted to understand women: what turns them on, how to please them and how to know the real meaning of their words. I always wanted to understand what they want, how they think, why they do what they do, so here's my wish: I want to understand. women!" The Genie let out a long sigh and said, "How do you want your bridge: 2 lanes, 4 lanes…?" Plus, you'll get an awesome welcome gift! I promise to use it only to send you Relationship Puzzle Bits. "Your website was really helpful, it gave me the perspective I needed to improve my marriage. THANKS!! Who knew these were common relationship problems."